Fans Pitch Bids For Former Red Sox Pitcher's Bloodstained Sock Baseball fans and collectors are bidding on baseball history: a bloodstained sock worn by Curt Schilling in the 2004 World Series. 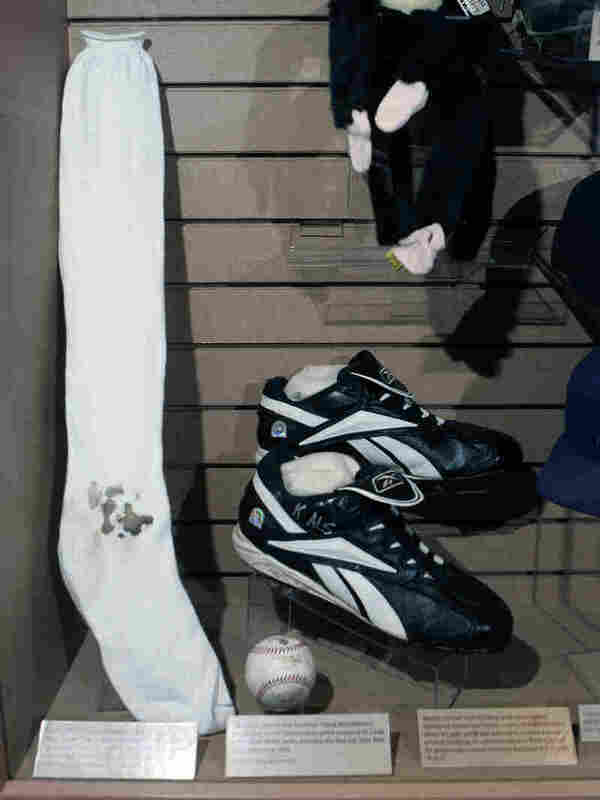 The sock had been on loan to the National Baseball Hall of Fame, but Schilling was forced to put it up for auction after his video game company went bankrupt. Boston Red Sox pitcher Curt Schilling's bloody sock and spikes are displayed at the National Baseball Hall of Fame. Schilling, whose video game company went bankrupt, is selling the bloodstained sock he wore during baseball's 2004 World Series. The 2004 Major League Baseball playoffs will always be remembered for an astonishing Red Sox comeback and a bloody sock worn by pitcher Curt Schilling. Well, actually there were two bloodstained socks. But the first was thrown away, and now the second sock is being auctioned off to repay Schilling's debts. Ask any die-hard Red Sox fan and he or she can recall the game by heart. It was Oct. 19, 2004. Schilling took the hill with a bum right ankle in a do-or-die playoff game against the Yankees. He had torn his tendon sheath and before the game, a doctor had stitched him back together. But as he walked onto the field, blood began to soak through his sock, forming a big red stain just above his Reebok spikes. Schilling pitched through pain to help the Sox win the game. The bloodstained sock became an iconic image for perseverance, heart and all the other sports cliches you can muster. That sock — sock No. 1 — went into a Yankee Stadium Dumpster after the game. But when he returned to the mound in Game 2 of the World Series, Schilling made sure to keep the new sock — sock No. 2 — that he wore, and again bloodied, as he pitched his team to yet another victory. The Sox went on to win the World Series that year, breaking an 86-year drought. Schilling later lent his second bloody sock to the National Baseball Hall of Fame and Museum. After leaving baseball, he went on to start a video game company. He called it 38 Studios, and he moved it to Rhode Island after receiving a $75 million loan guarantee from the state's economic development corporation. The company went on to release the critically acclaimed game Kingdoms of Amalur: Reckoning. It was full of sorcery, flame blades and even a dragon. But Amalur would be the only game it produced. Schilling's company went bankrupt soon after its launch, laid off all its employees, defaulted on its loans and left Rhode Island on the hook for around $100 million. The collapse of 38 Studios pretty much left Schilling broke. So he took bloodstained sock No. 2 back from the Hall of Fame and put it on the auction block. He's selling it to help repay some of the debt he incurred. Heritage Auctions has already opened up online bidding for the sock. Chris Ivy, Heritage's director of sports auctions, says it's the symbol of everything brave in athletics. "It's the embodiment of what I call the blood, sweat and tears that it took the Boston Red Sox to overcome the 'Curse of the Bambino,' " he says. Schilling tends to his right ankle during Game 6 of the American League Championship Series against the New York Yankees in 2004. The sock, Ivy says, is in a temperature-controlled vault in Dallas. Some Rhode Islanders were upset about losing state money to a baseball player with little business experience. But the people hanging out at Patrick's Pub in Providence didn't really care about Schilling's financial shortcomings or the impact on the state. Red Sox fan Jeff Sowa was more concerned about correcting his buddy about which bloodstained sock is the item of lore. "Are you kidding me right now? The World Series? Well, he wore another bloody sock for that game. But that's kinda fraudulent. The real bloody sock was Game 6 of the ALCS," he says. Still, that sock is a great deal for fans, and paying a heavy fee wouldn't be a bad trade for an iconic piece of clothing. "From the second one? Zero," Sowa said when asked how much he'd be willing to pay. "Game 6 of the ALCS, I would probably pay everything in my bank account. But Game 2 of the World Series I would not pay a dime." Sowa won't be making a bid on the sock. But Heritage Auctions believes the bloodstained sock from the 2004 World Series could fetch more than $100,000.